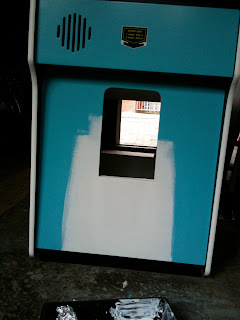 - New cut made for the Nintendo coin door and repainted the area. 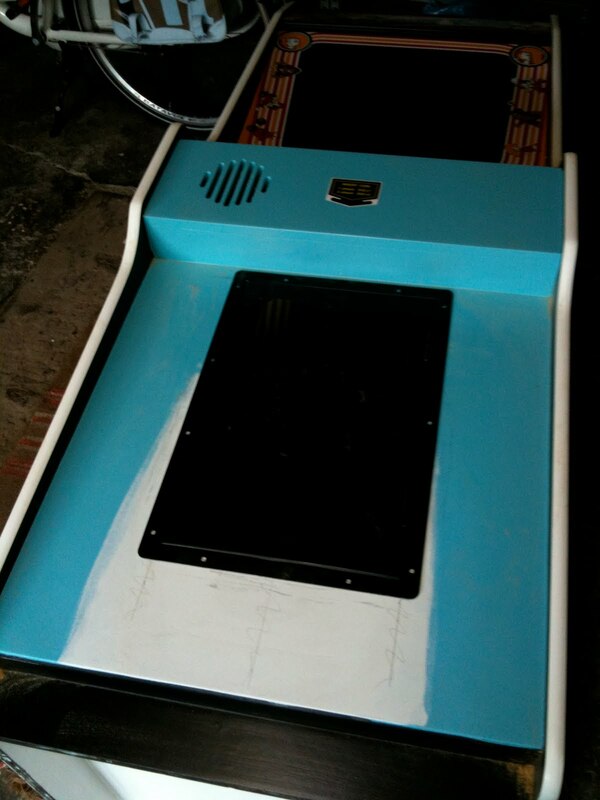 - MAME setup and controls are working great. - Cleaned coin mechs but need some more work. - Coin door straightend and resprayed, but needs more work. 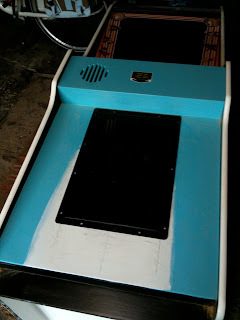 Talking about MAME, I have been thinking about abandoning the computer setup with MAME and go for an original Donkey Kong board instead. Even though I have MAME set up real nice and clean now and every pixel is where it should be, the idea of putting a real board in there with a rich history makes me more happy everytime I think about it :) So i need to buy me a DK board, a Nintendo>JAMMA adapter (Mikesarcade's adapter houses a color inverter and audio amp which I will both need) and a cheap little supergun or build something myself for connecting it to the scart TV and controls. This thing is coming together nicely! 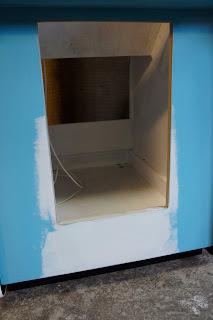 Really amazed by how good the "first" coat of blue looks! Tomorrow another and probably final layer. Sanded and cleaned. 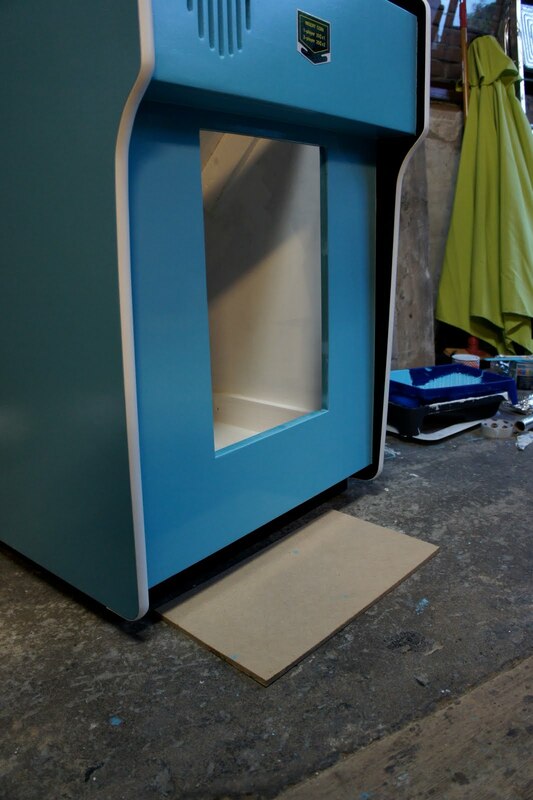 Just before I put the first coat of blue on. 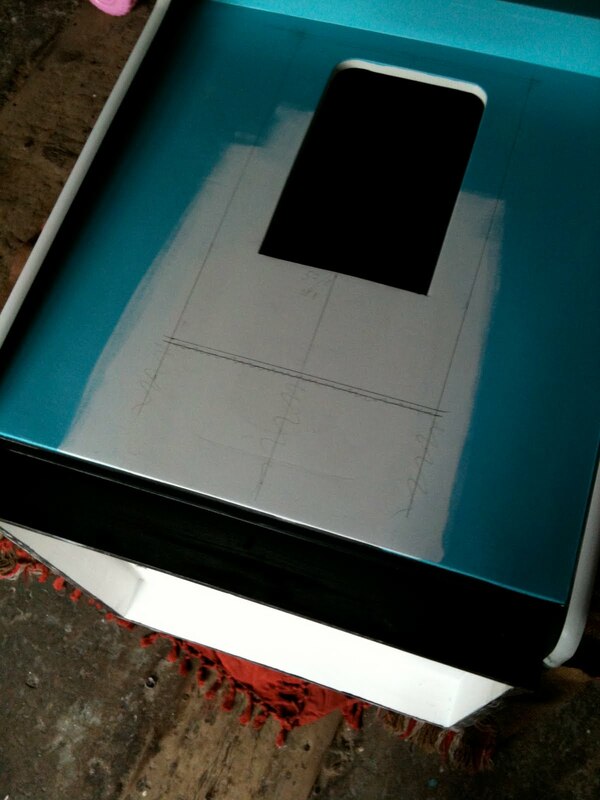 To get it perfectly smooth, two coats of primer and three layers of bondo were applied in total. New coin door cut-out drawn on the cabinet. Ready for the jigsaw! As you can see here, just a little more bondo is needed to make it perfect. New coat of primer and some more sanding. 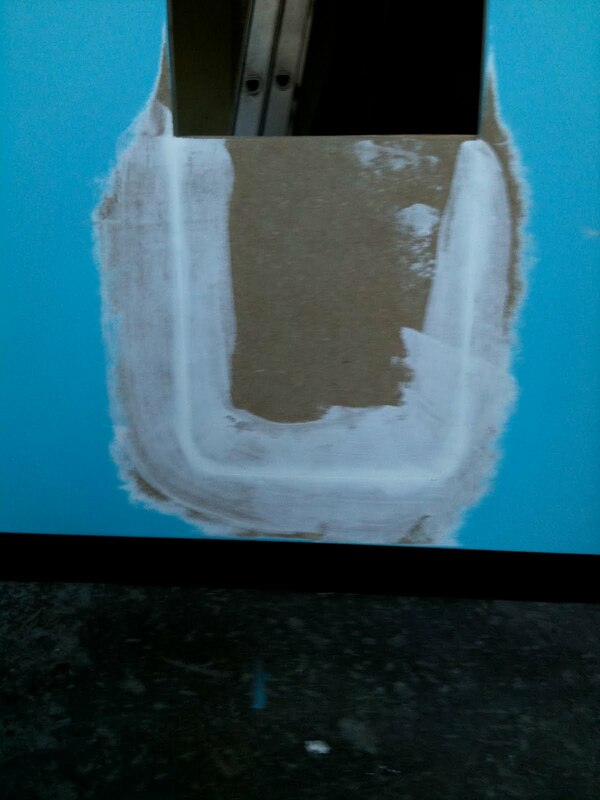 Piece glued in and applied first layer of bondo. 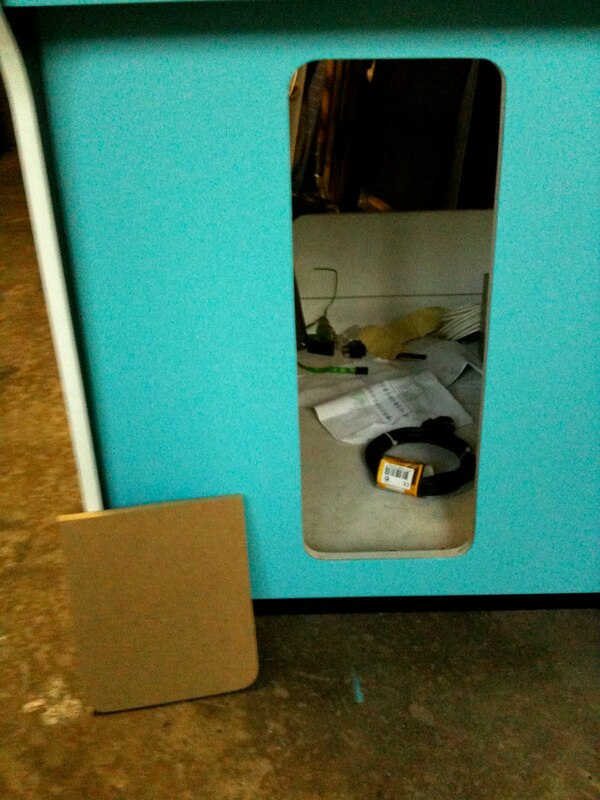 Cut out a piece of MDF big enough to fit in the old coin door hole. 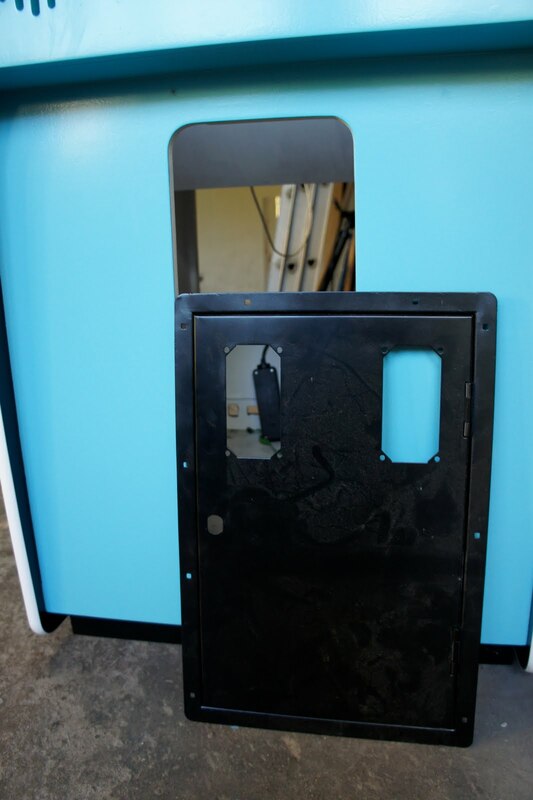 New original DK coin door is wider, but shorter. So had to redo the cut-out. Straightend and resprayed coin door in front of the cabinet before cutting the new door opening. - Sand and anodize the aluminium back to original look. 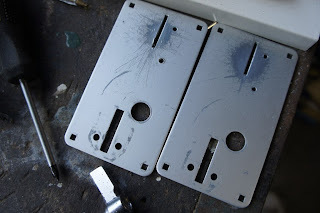 Coin mech face plates. Tried paint remover on them because I would like to see how the faceplates looked like underneath the thick ugly paint. If I'd sanded it right away I would have a lot of scratches from sanding on them before even deciding wether to paint them or just clean them. 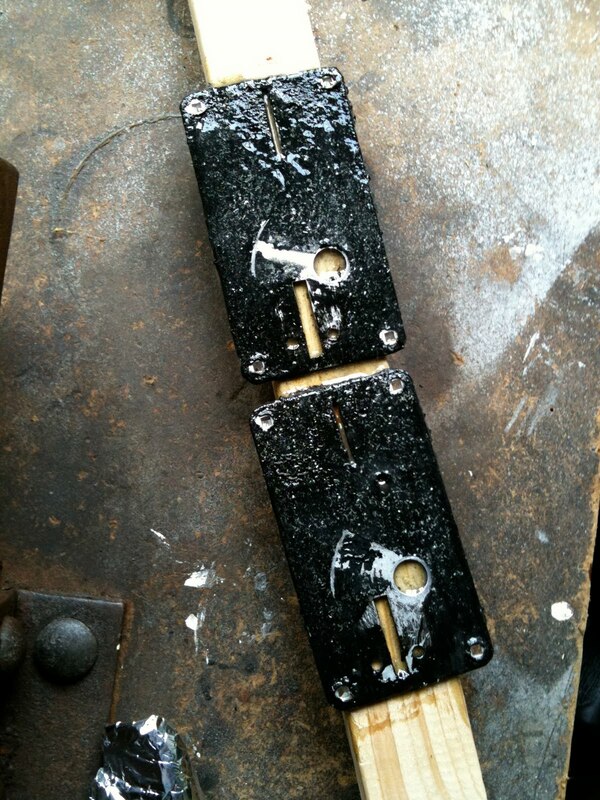 Coin mech faceplate before cleaning. Missing the coin reject thing, that's a pitty :( Luckily Mikesarcade has them. 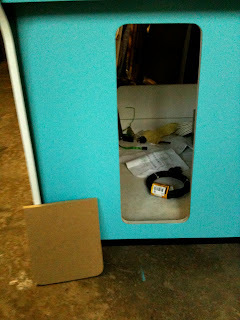 Philips scart TV mounted on a square piece of MDF, exactly the width of the cabinet. So it is easily rotatable! Pixel perfect Donkey Kong image, thanks to a scart TV, Ultimarc's Arcade VGA and MAME. Hooked up with home-made VGA>scart cable. Image looks exactly the same as an original DK board would look like on an arcade monitor. 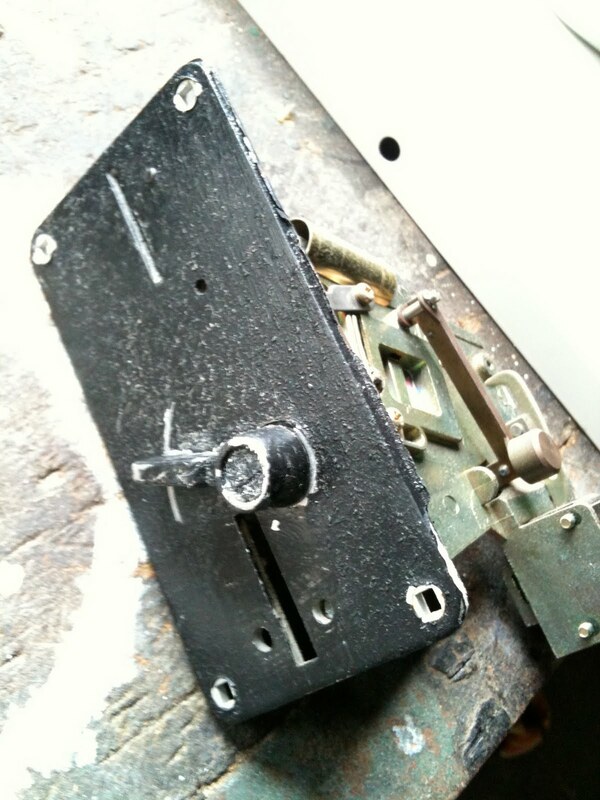 Underside of control panel. Everything hooked up and working now. Only need swapping of the Sanwa JLF joystick with an original Nintendo joystick. Hey, great job with this. I was wondering how you got the blue color? It looks pretty close to the original. I always thought it would be cool to build a "MAME" cab off of this style that runs all the old Nintendo arcade games. Looks top notch! Love Donkey Kong, I really want to make one - but I was wondering the same - where I can get the colour match from?? there's quite a few people that have made them, this guy has a shopping list of all the bits used - looks a pretty good cab too!